Vape pens and e-cigarettes are peaking in popularity right now. People trying to quit smoking cigarettes, or people who just like to have plumes of smoke around their heads are the target audience of vape manufacturers. Because these devices are so new, there isn’t a large body of research around health effects or even much product testing on the devices themselves. On May 5, a 38-year-old Florida man was using his vape pen at home and the pen exploded, killing him and starting a fire. After an autopsy, reports CBS News, authorities found the force of the pen’s explosion was so great that it thrust several pieces of the vape pen directly into the man’s head. The fire that broke out also caused burns over 80 percent of the victim’s body by the time firefighters were able to get to him. Authorities believe the injuries to his head were too severe for him to have survived. This is the first death attributed to vape pen/battery explosions. The vape pen was designed and manufactured by a company called Smok-E Mountain. In a statement provided to CBS, a company representative said that their devices do not explode, and they believe the issue was either an atomizer or battery, noting that they have had problems with other companies cloning their batteries with inferior models. The FDA is currently looking into the incident to see if this is a product liability or defective product issue. Currently their results are inconclusive and their only theory is that the explosion had something to do with the vape pen’s battery. Don’t carry vape pen batteries loose in your pocket or bag where they could come into contact with coins, keys, or other metal objects—these can cause the battery to short out. Only use the charger that came with the original device. Never use your phone or tablet charger. Don’t charge your e-cig or vape pen while sleeping or leave it plugged and unattended. Charge it on a flat surface, away from anything flammable. Don’t charge it on the bed or couch. Replace the battery immediately if it gets wet or damaged. Use the batteries recommended for your device. Don’t mix and match different brands, and don’t mix and match new and old batteries. Don’t mod or alter your device or disable any safety features. Protect your vape or e-cig from extreme temperatures—don’t leave it in direct sunlight or outside in freezing temperatures. 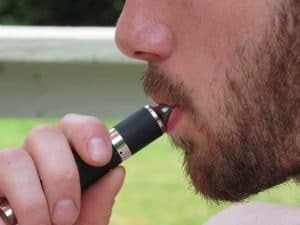 More and more injury cases involving vape pens and e-cigs are popping up all over the country. Talk to the experienced Phoenix attorneys at Plattner Verderame, P.C. about your potential case as you may be entitled to compensation. Talk to our skilled legal team today by calling 602-783-8793 or filling out our contact form.